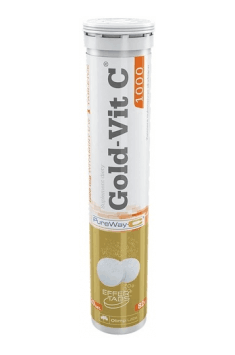 Gold-Vit C 1000 20 tab. Dissolve 1 tablet in 200 ml of water. Best served chilled. There is a lot of controversy around vitamin C supplementation and its proper dosing. According to many researchers, currently recommended intake of vitamin C is not sufficient and in reality means a minimal dose for the proper functioning of the organism. It is believed that the need for vitamin C is an individual feature and the dose should be adjusted to each person. There is also a method that may help to determine the dose that our organism needs – in consists in taking a certain amount of vitamin C every 15 minutes until a laxative effect appears, which may mean that our organism is sufficiently satiated with this vitamin.